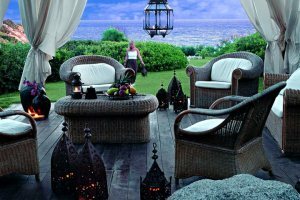 This elegant hotel is set in the countryside just south of the holiday resort of Villasimius, a spectacular hour’s drive along the south coast from Cagliari. 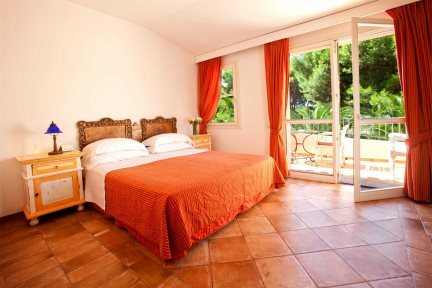 The architecture is just delightful – Hotel Cala Caterina is built from local stone in a traditional Mediterranean style with frescoed walls and long shady colonnades. 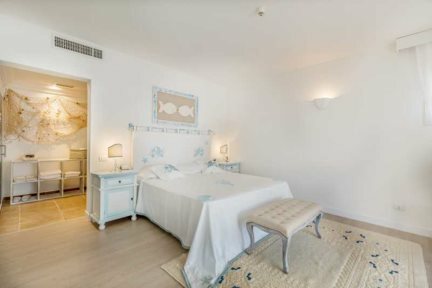 Situated on either the ground or first floor, the rooms are all tastefully furnished in elegant pastel shades, with painted wooden furniture, marble topped tables and a terrace or balcony. 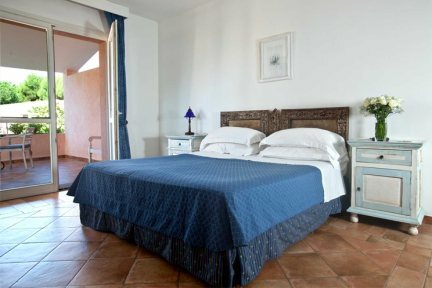 Each room is subtly different, perhaps with the addition of a piece of antique furniture or a locally made wall hanging, which contributes to the personal feel of the property.The hotel restaurant offers delicious Italian and European cuisine, and the large pool area provides ample space for relaxing in the sun or shade. Just a short walk through the lovely gardens, pine trees and palm-fringed lawns, lies the Cala Caterina beach – a small bay edged with smooth granite rocks, crystal clear water and a white sandy beach well equipped with loungers and sun shades. There are plenty of sporting activities available nearby, including water sports and boat trips, tennis, scuba diving and horse-riding. Shared pool, restaurant, bar, lift, internet point, umbrella and sun loungers. Payable locally: wellness centre. En-suite facilities, garden facing or sea view, safe, satellite television, air-conditioning, hairdryer, minibar. Classic Rooms are decorated with painted wooden furniture and marble topped tables. They are all situated on the garden side of the hotel, on the ground or first floor with a terrace or balcony and a small table and two chairs. All with double or twin beds, en-suite shower room or bathroom. Comfort Rooms are decorated with painted wooden furniture and marble topped tables. All with double or twin beds, en-suite shower room or bathroom. Pretisge Rooms are decorated with painted wooden furniture and marble topped tables. 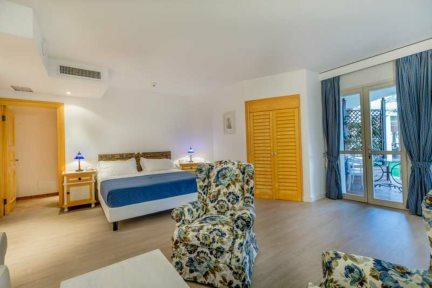 They are all situated on the sea side of the hotel, on the ground or first floor with a terrace or balcony with partial or lateral sea view and a small table and two chairs. All with double or twin beds, en-suite shower room or bathroom. Located in the first floor, deluxe rooms offer a sea view and renewed bathrooms. The Junior Suite (40 sqm.) 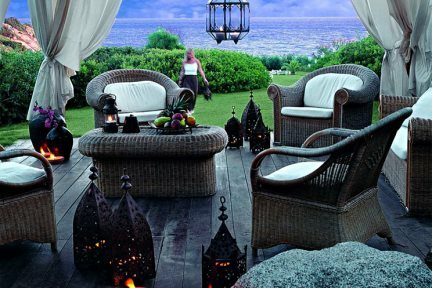 is located on the ground floor with patio and it opens on the main garden with partial sea view. It is composed by a room with double bed, living room with sofa bed. The Sea View Suite (65 sqm.) is located on the first floor with a terrace of 20 sqm. and a stunning sea view. It is composed by a double room, a living room with sofa bed and single bed.